Richard and Leigh Woods now spend their days tending their large, prize-winning alpaca herd and running their successful plant nursery in the beautiful Derbyshire countryside. A stark contrast to their former high flying corporate careers, and one they both definitely prefer. They live in a spacious log farmhouse sited on their land, something that just a few years prior, they thought might never be an option. Norwegian Log Buildings helped them through the rural planning maze and showed them how they could own a beautiful home, just where they wanted it. When the Woods decided to move into horticulture, growing plants commercially and selling them at gardening shows across the UK, the couple started to look for land on which to build a nursery, settling on four acres in rural Derbyshire. 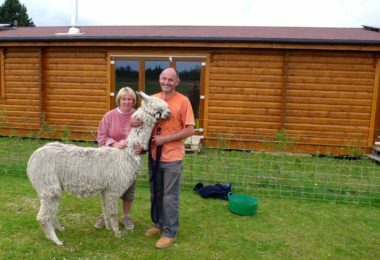 Initially, they had no intention to live on the land but as the smallholding developed, with a second polytunnel, they realised they could make use of their open grassland. 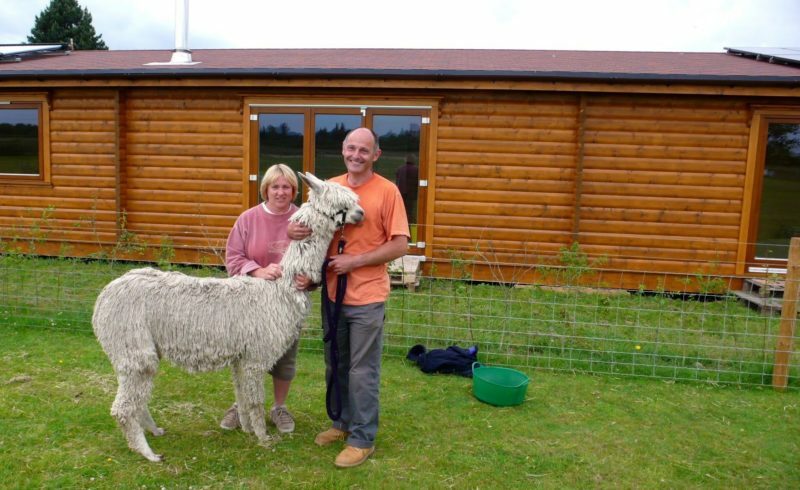 After much research, they bought three breeding Suri Alpaca females, famed for their high quality and high value, and the beginnings of their herd was born. As the herd expanded, it soon became apparent that living close to the animals was the only solution. “We couldn’t maintain the business and the correct standards if we didn’t live on site, and also the importance of animal welfare,” said Leigh. So, the Woods applied for, and were granted, planning permission for a temporary building on the site. Not wanting to live in a caravan for three years whilst waiting for consent for a permanent structure, the Woods looked at possible solutions and discovered Norwegian Log Buildings could deliver the home they wanted without the wait. 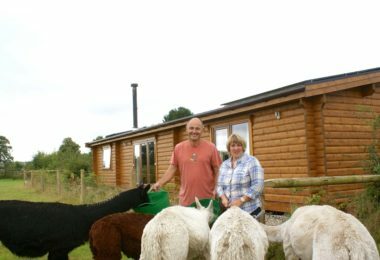 The company has 30 years’ experience of designing and constructing homes for smallholders and because the buildings are transportable, they comply fully with the Caravan Act as a mobile home. They are also zero rated for VAT and exempt from building regulations. 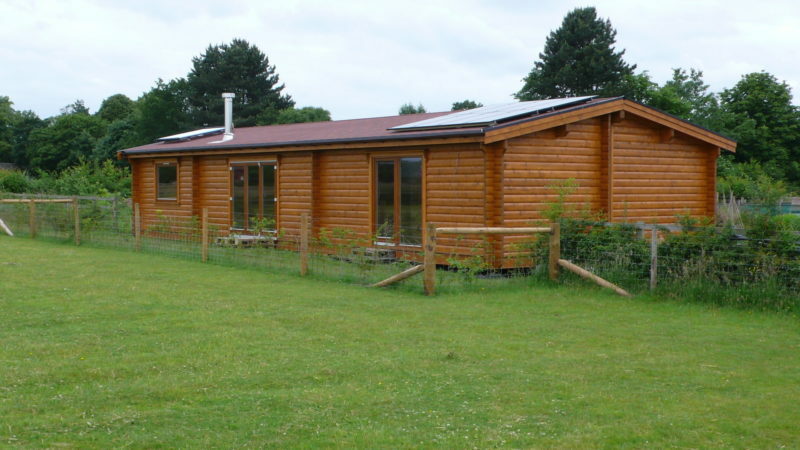 The Woods’ log home is 16.8m long and 6.8m wide, the maximum width allowed, and took a little over eight weeks to complete from the site foundations to the finished building. It boasts a farm office/study, large open plan family room with kitchen and two bedrooms with bathrooms, a utility room and cloakroom. Being off the power grid, the couple installed photovoltaic solar panels on the roof so ample electricity is generated for the home and site, whilst fresh water is drawn from a 250-foot borehole. Heating and hot water is boosted by thermal tubes on the roof and a log burner with a back boiler for the winter months. “This is a great example of how we work with customers to deliver the ‘temporary’ home they want, within the National Planning Policy Framework. 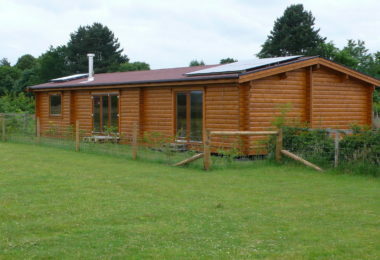 In this instance, the site was below the minimum 7.5 acres threshold for temporary buildings in the rural community but the Woods could demonstrate that their business was active and sustainable before moving to the site,” said Nick Forrester of Norwegian Log Buildings. Today the Woods’ Whistling Duck Alpaca business is home to a herd of alpacas with a string of champions and their nursery Lilies and Chillies is still growing strong. Leigh sells a range of yarn and uses it to weave and crochet. They have also been granted permanent planning permission from the council. More information on Norwegian Log's transportable home range, plus brochures and pricing, can be found here.